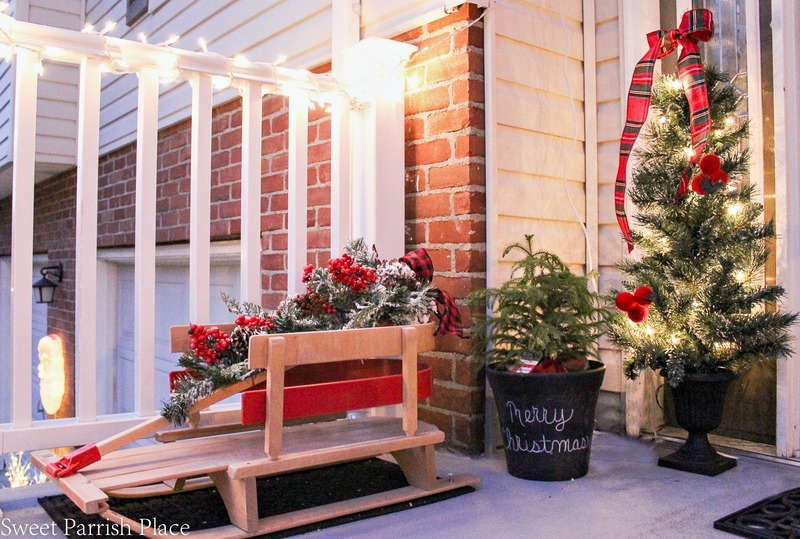 This is part three of my Christmas Home Tour, my Christmas Front Stoop. Hey friends! 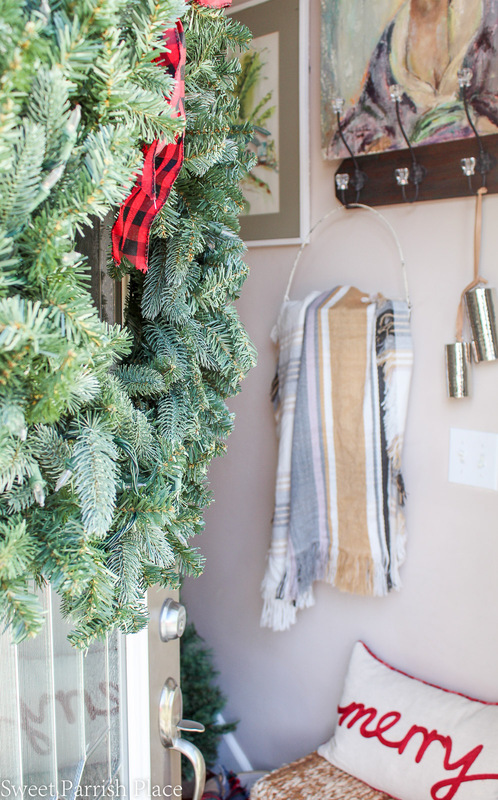 I feel like I am always behind schedule for sharing my Christmas decor on the blog, and this year is no different. So I thought I would pop in on This Saturday and share my outdoor Christmas decorations. 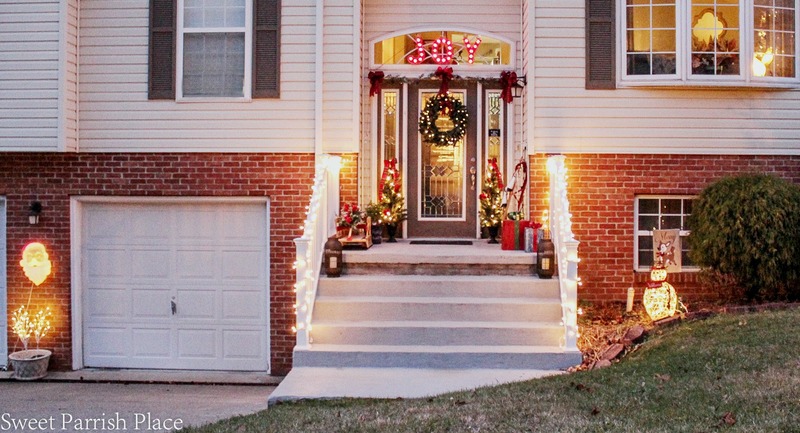 This is my Christmas front stoop and yard. 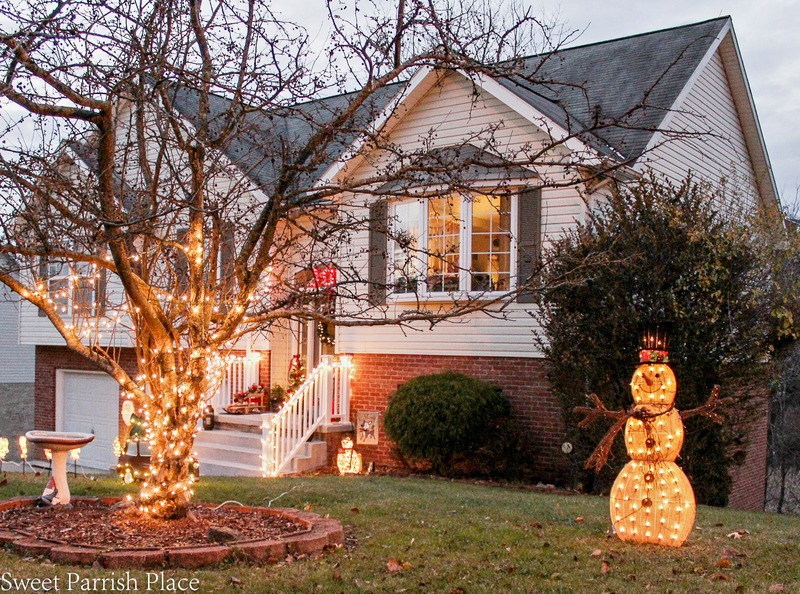 We keep things fairly simple outside, but still enough to look festive. 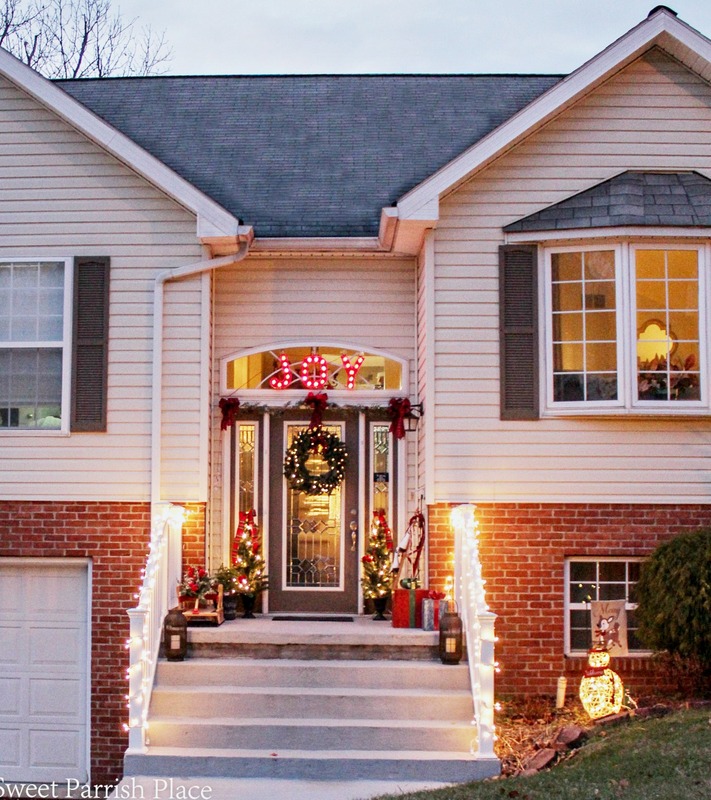 It’s not often that I share the exterior of my home on the blog. But welcome to our split level home! This home was built in 1996. Not much has changed outside. We did get a new front door when this house was under contract for us to buy. We painted the front door and shutters shortly after moving in. And a couple of summers ago, we replaced the riling going up the stairs. Last summer, we painted the concrete stairs and stoop. It is time to replace our roof that is original to the house. And we are planning to possibly do that this upcoming summer. 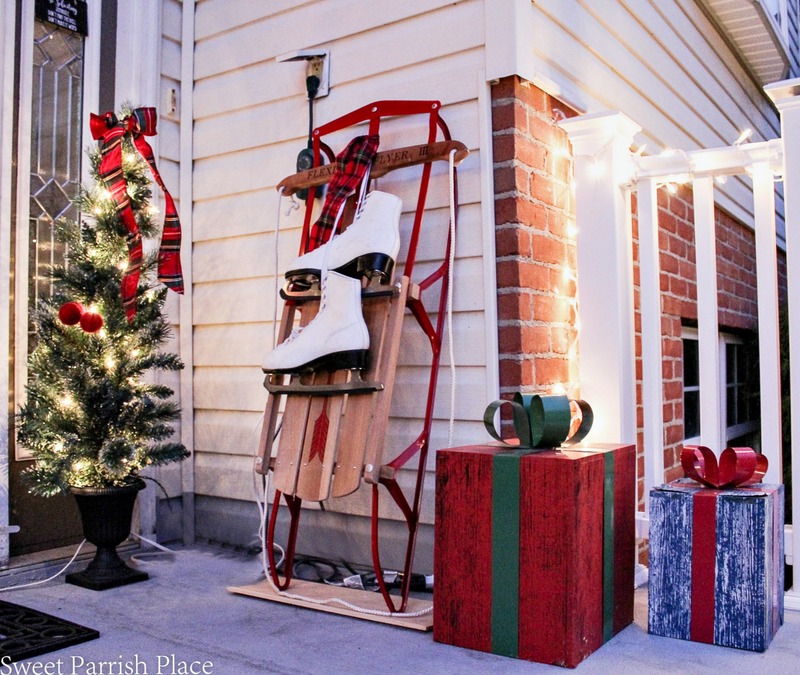 The Santa you see in between the garage doors is a vintage Santa head that used to belong to Mr. SPP’s grandmother. It is in great shape and we enjoy hanging it each year since we got it. I decided to take these photos at dusk so you could see the pretty lights. Christmas outdoors always looks better when it get dark, am I right? 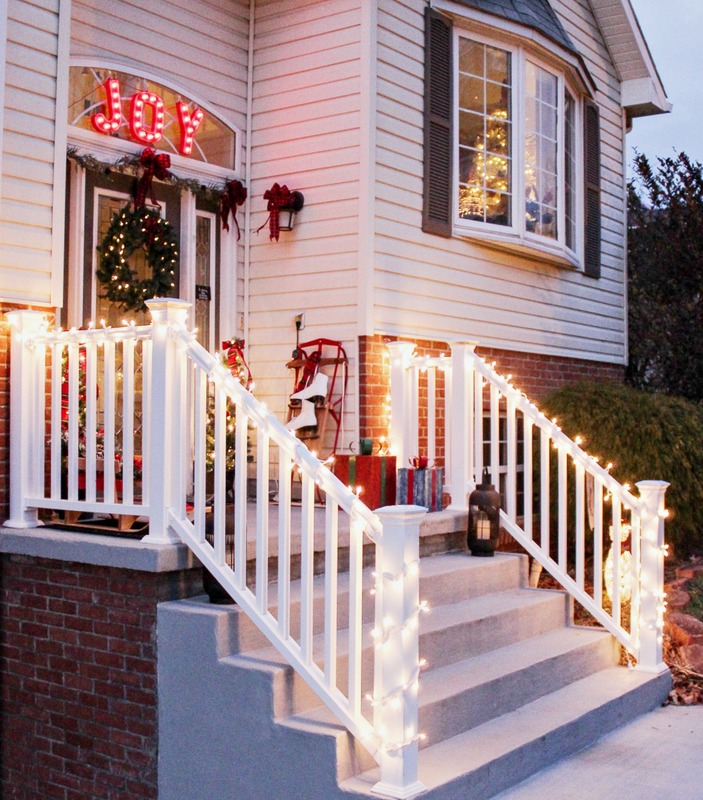 I kept things fairly simple on the front stoop this year with simple white lights on the railings. 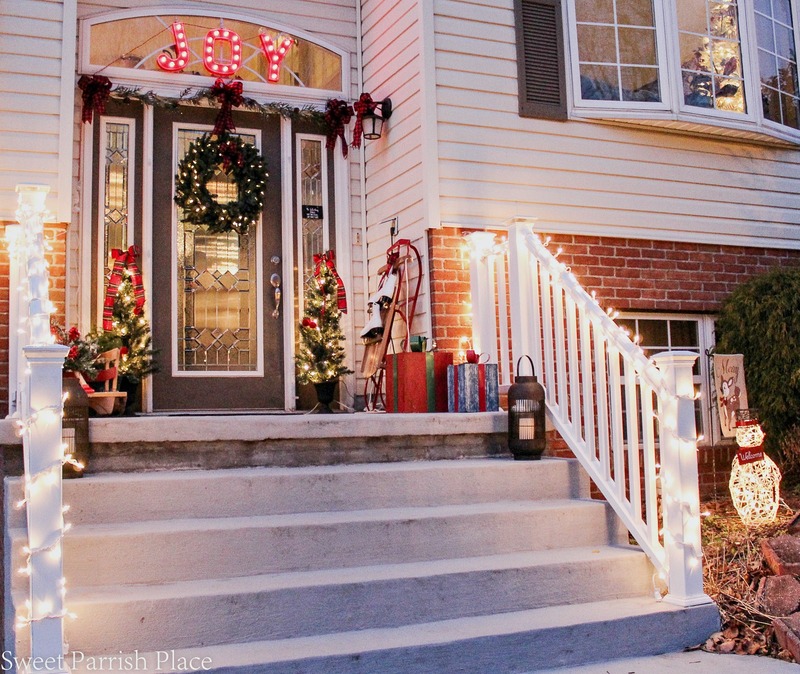 I usually attach big red bows to the railing as well, but I just didn’t feel the need this year. 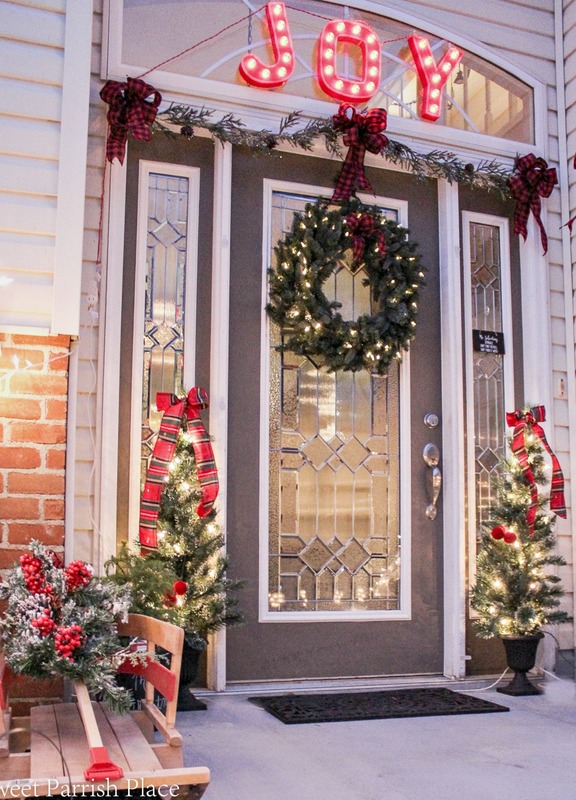 I bought the front door wreath last year, and I was going for something that looked realistic. I found this one at Home Depot, and it has led lights and a little battery pack that you can set on a timer. 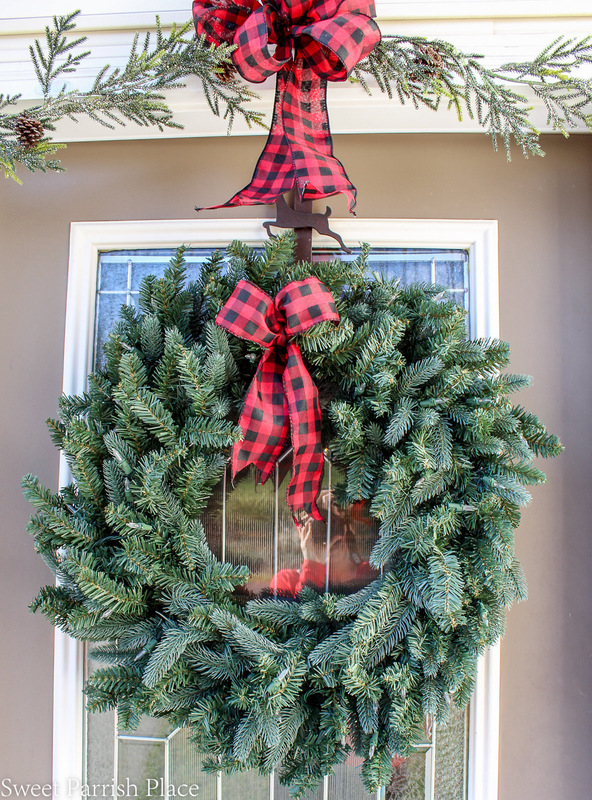 I added a single plaid bow to the wreath. I strung some greenery above the door and added bows that match the one on the wreath, and also a bow attached to the light. 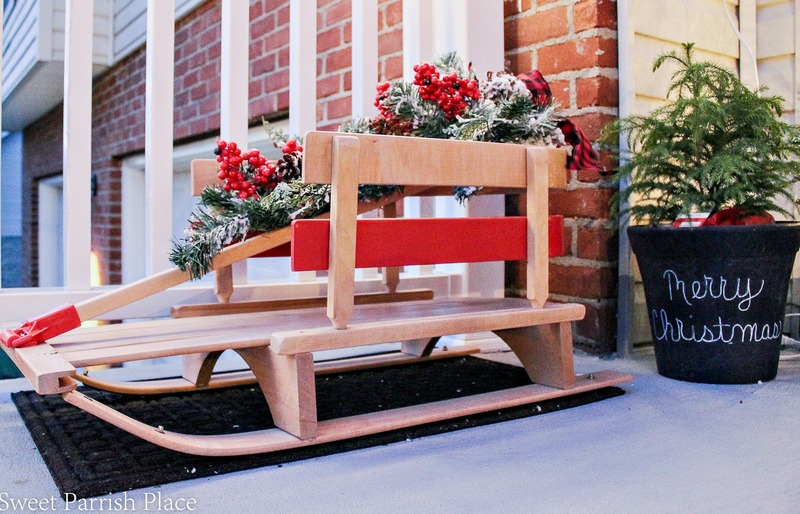 I have had the two sleds you see on the stoop since my children were little, both of them gifts from their grandparents. 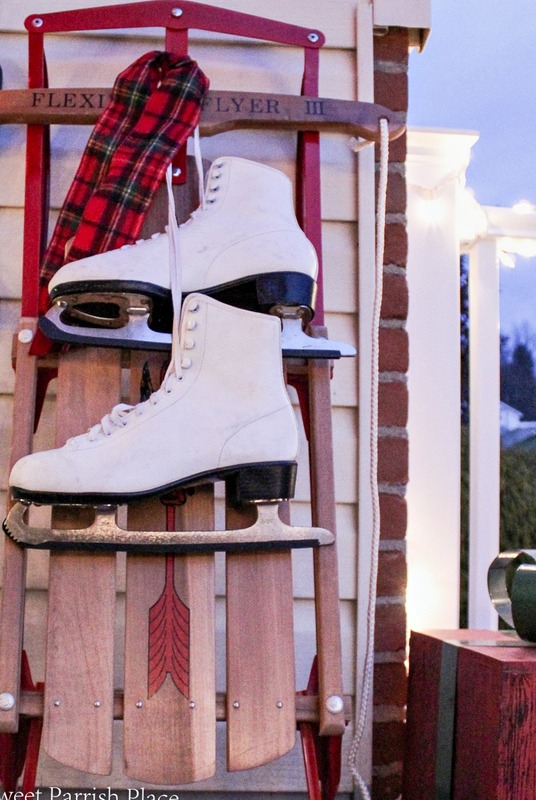 I found the ice skates at a thrift store, and knew they would be perfect to hang on one of the sleds at Christmas. Last year I got some rust stains on the concrete when I put these sleds out, so this year, I places things under them because I didn’t want my new paint job to get ruined. I bought this fresh little pine tree and we are hoping we will be able to eventually plant it in the ground. 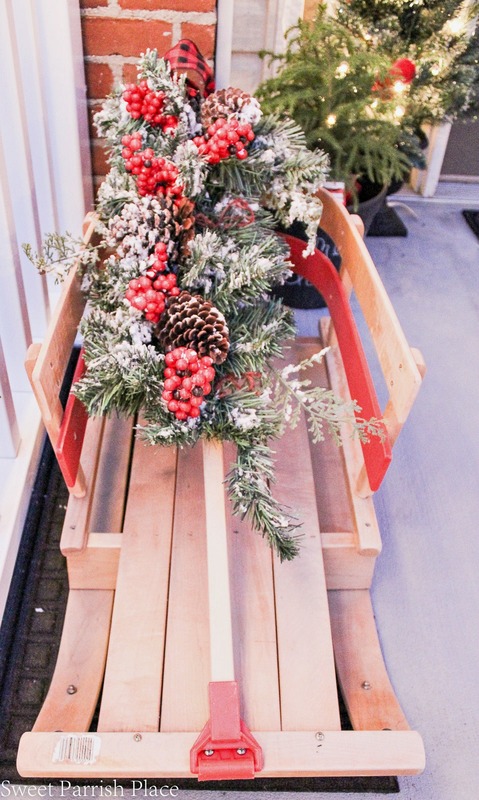 I thought this swag looked cute attached to the handle of this sleigh. And more plaid bows on the little trees on either side of the door. The letter that spell Joy fit perfectly above our front door, and this is the second year we have used them. 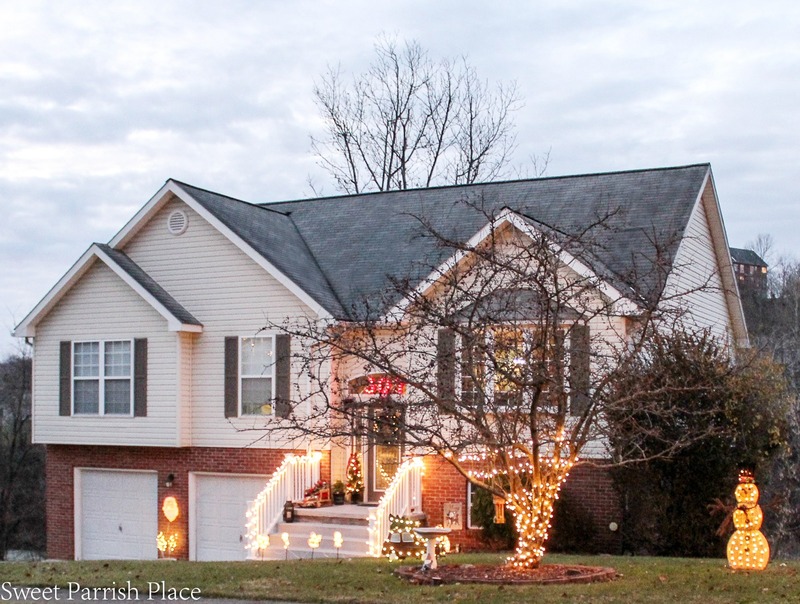 I still have one more part of my Christmas home tour to share, and it will be coming to you next week. It’s my dining room. I didn’t really decorate our kitchen this year because we are getting new counters very soon. As a matter of fact they were supposed to be here early this month, but still nothing. I am anxiously awaiting them though! 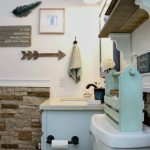 I hope you enjoyed seeing the outside of the house that I am always sharing the inside of on the blog! Enjoy your weekend! Your home is adorable and being a northerner, I am jealous of your lack of snow! Thanks so much Kari! The snow will come, it’s jut a matter of time! I swear I would be happy to move somewhere warm and never see snow again,honestly! 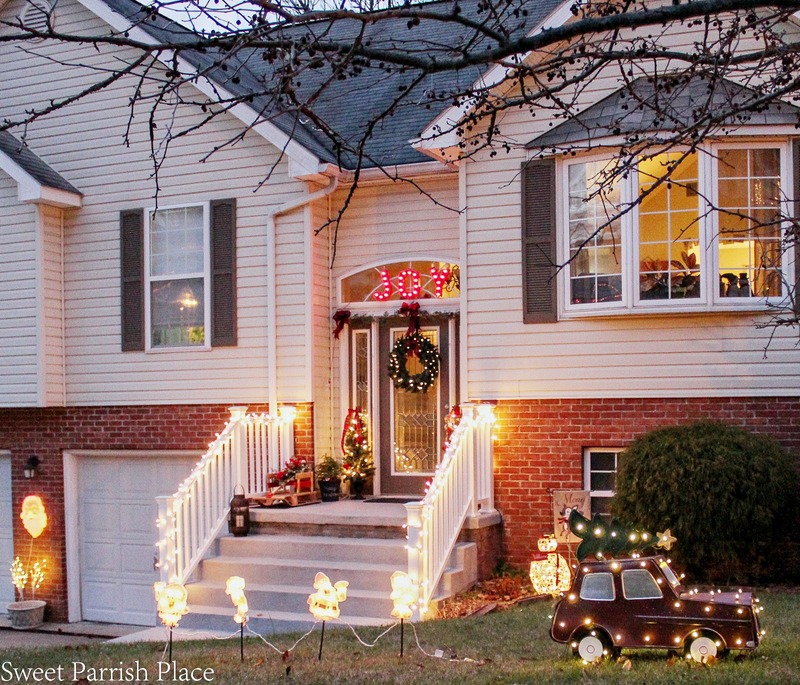 Your home shouts a big welcome and Merry Christmas. It looks so lovely. You are so sweet Debra, thanks so much! And Merry Christmas!